Feb 5, 2017; Boston, MA, USA; LA Clippers forward Paul Pierce (34) waves to the crowd after a game against the Boston Celtics at TD Garden. BOSTON (AP) — Isaiah Thomas bumped into Paul Pierce tooling around Boston on Saturday night and then stole the spotlight from the former Celtics captain on Sunday. With the crowd uncertain whether to cheer loudest for the Celtics or for Pierce — or for the Patriots in the Super Bowl — Thomas scored 28 points to lead Boston to its seventh straight victory, a 107-102 win over the Los Angeles Clippers in Pierce’s final game in the Garden. Thomas backed off Pierce in the final seconds, with the game out of reach, to let the 2008 NBA Finals MVP sink one more basket on the parquet floor he called home for 15 seasons. Playing his last game in Boston, and making his first appearance for the Clippers since New Year’s Eve, Pierce started and played the first five minutes before heading to the bench. Although the crowd chanted his name in the final minutes — egged on by the Celtics cheerleaders and even Thomas himself — Pierce didn’t get back off the bench until there were 19 seconds left. With the fans already standing, he sank a 3-pointer for his only points of the game. Al Horford had 13 points and a season-high 15 rebounds for the Celtics, who brought Pierce to tears with a first-quarter highlight video. Thomas had eight assists but saw his four-game streak of 35-point games snapped. Blake Griffin and Jamal Crawford scored 23 apiece, and DeAndre Jordan had 16 rebounds for Los Angeles, which lost for the sixth time in eight games despite cutting a 12-point lead to 103-99 in the final minute. As the crowd was filtering out to get home in time for the Super Bowl, Pierce walked back onto the parquet floor, dropped to his knees and kissed the leprechaun at center court. 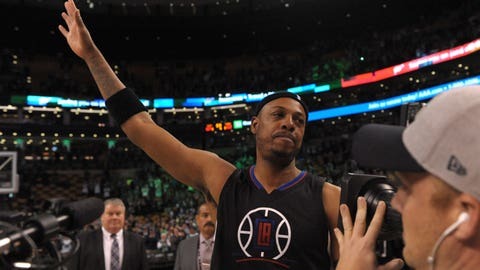 Former Celtics coach Doc Rivers started Pierce so he could have a fitting farewell, even though the 39-year-old forward hadn’t played in more than a month. Before the game, he told the Clippers to pay attention. Boston led by as many as 18 points, and Los Angeles never had the lead. The Clippers went on a 10-2 run in the last two minutes to make it a one-possession game, but Griffin missed a 3 from the left side; Horford got the rebound and sank his foul shots. It was Pierce’s 630th game at the new Boston Garden. He has never failed to score in the building…. Celtics G Avery Bradley missed his 10th straight game with a sore Achilles tendon. … The Celtics took a franchise-record 52 3-pointers. … Celtics Jaylen Brown and Jonas Jerebko took each other out when they collided under the basket early in the fourth quarter. Jerebko (nose) did not return. … Pierce’s final 3-pointer was the only one made by a Clippers starter. Clippers are at Toronto on Monday. Celtics are at Sacramento on Wednesday.